If you haven’t seen this you should take five minutes to watch it. I have for a long time been impressed with what these guys are doing. And remember, just because it’s government doesn’t mean it has to be anything less than brilliant. Last week I heard Russell Davies, Creative Director at the Government Digital Service speak. 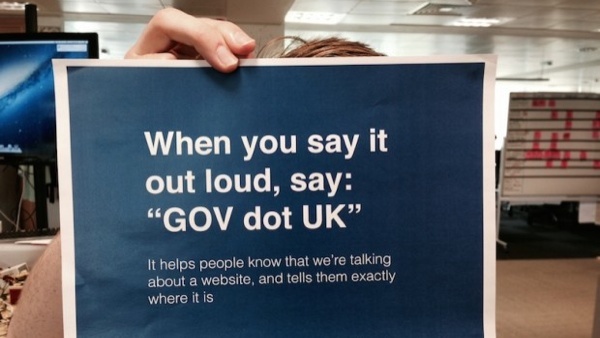 In his typical I-am-going-to-show-you-a-bunch-of-screengrabs-of government-websites style he underplayed the massive impact the service has had on the way the UK Government does digital business. He outlined three rules to abide by. Simple, obvious but so often forgotten. Get the basics right first. It works. Product is the service is the marketing. Isn’t that what Google did?! Innovation is more about copy and iterate and less about original thinking than you might think. Here is the live blog of that session. Go read it.